This chapter is devoted to the analysis of the self-adaptation (SA) of the mutation strength a on algorithms similar to the (1, λ)-ES. The basic (1, λ)-σSA algorithm is introduced and explained in the first section. The second section extends the theoretical framework to enable the analysis of the σSA. This framework includes the microscopic part, i.e. 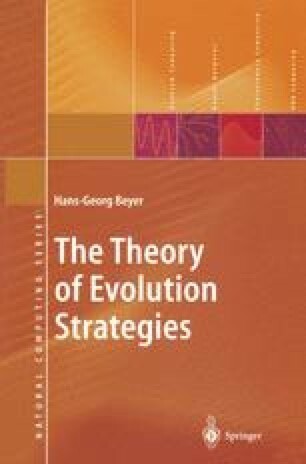 the analysis of the “driving forces” of the σSA, as well as the evolutionary dynamics. In the third section, the microscopic measures progress rate φ and self-adaptation response (SAR) ψ are determined and approximated for the case of the sphere model. Using these results, the dynamics of the self-adaptive (1, λ)-ES will be calculated in the fourth and and fifth sections. The essential aspects of the dynamics can be investigated by neglecting the statistical fluctuations. The most important results of the analysis are the scaling rule for the learning parameters and the prediction of the adaptation time. In the fifth section, these results are validated by considering the fluctuations: it will be shown that the (1, λ)-σSA-ES attains a linear convergence order if the learning parameters are chosen appropriately. The sixth section concludes this chapter and discusses the applicability of the results obtained to ES algorithms with μ > 1.